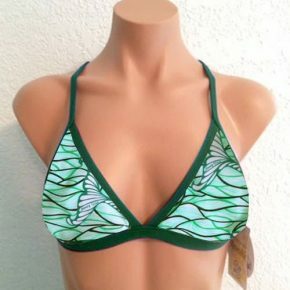 Jules Reversible Triangle Sport Top Honey Comb Print, Color: Mocha, reverses to Solid Brown with Light Aqua Straps. Straps cross and tie in back. Lightly padded sewn to an inner lining so it won’t scrunch up.